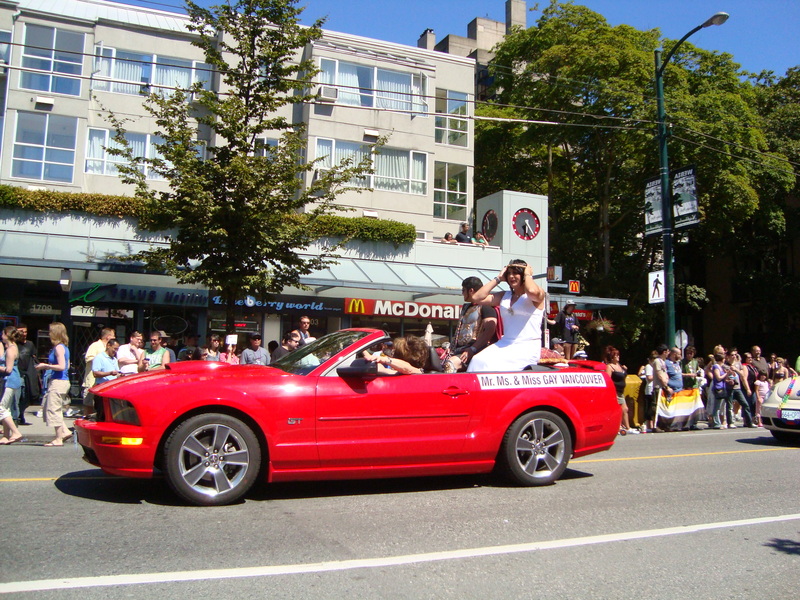 After meaning to do so for years, but always forgetting or being out of town we attended the 30th annual Gay Pride Society parade celebrating Vancouver Pride Day this past weekend in Vancouver. (Did I mention I went with my wife?) We were among 400,000 spectators watching what was truly a spectacular event. There was a lot of advertising mixed in among the entrants from political, religious and social groups, but there were not many business or service entrants which surprised me as a captive market of 400,000 people is a great marketing opportunity. 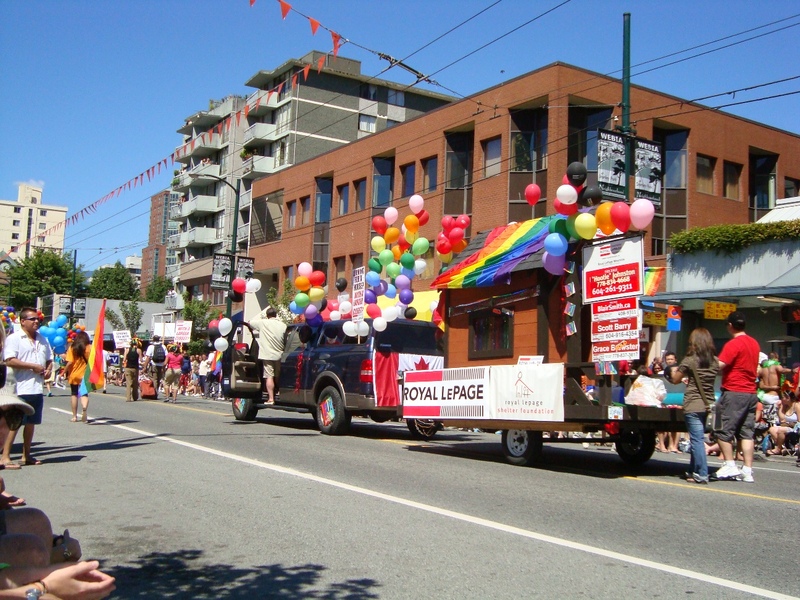 The one float that caught my eye and stood out with a headline that grabbed your attention was a national real estate company called Royal Lepage. In particular four Realtors by the names of Hootie Johnston, Blair Smith, Scott Barry and Grace Brewster. 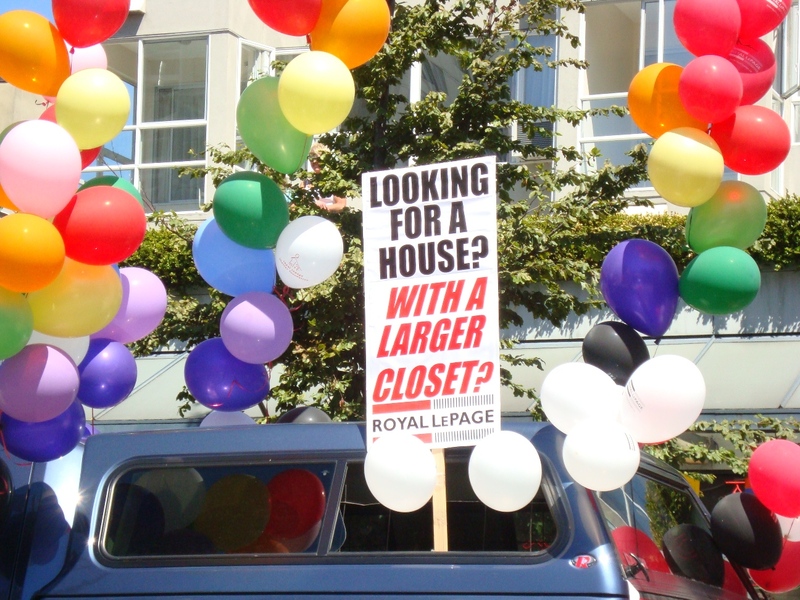 Now I have no idea what their motivation was to advertise, personal or business, but considering the Gay and Lesbian population in Vancouver is considerable in number and make up a significant percentage of buyers I think this was a perfect venue to reach out. I thought this was witty, provocative and it made me think. I am sure I was not alone. The float was rather simple as you can see below, but it was a winner in my marketing books. Next Post When Do You Check Your Email? Thanks for the kind words about our fun entry in the Pride Parade. Our offices represent the full diversity that Vancouver offers and we thoroughly enjoyed the opportunity to get out and have some fun! Personally I have been in over 25 Pride parades here. Representing bars in the early years and a couple favourite charities and even some advocacy issues. Last year there was some controversy about too many “corporate” entries. I remember the years when people hid behind masks and costumes. We’ve come a long way baby, and it is great to see as many people line the streets for this celebration as attend the fireworks in English Bay. And yes, a great marketing opportunity to the whole city. Finally, thanks for the loinks to our websites.